1 » When not talking about himself (let’s face it, those were the questions he was asked), Florida Gators junior All-American cornerback Vernon Hargreaves III spent time at the 2015 SEC Media Days on Monday propping up his teammates. Hargreaves believes the Gators will be the best secondary in the nation next season – and for good reason – but thinks that an overlooked member of that unit may be the reason why it could go from great to dominant as the year progresses. If Wilson has truly progressed to the level where he’s deserving of Hargreaves’s praise, he would be the nice complement to Hargreaves, Tabor and senior Brian Poole. The Gators will also role with redshirt junior Marcus Maye, junior Marcus Maye, redshirt sophomores Marcell Harris and Nick Washington, and sophomore Duke Dawson in what should be an absolutely loaded unit next season. 2 » Former Gators CB Loucheiz Purifoy was one of four NFL free agents suspended by the league last week. Purifoy, who received a 10-game suspension most likely for another violation of the league’s substance-abuse policy, is now unlikely to be signed with a team this season. Once a flashy talent for Florida who was so dominant on special teams and exciting on defense that the Gators gave him at a shot at wide receiver, Purifoy was not selected in the 2014 NFL Draft due to off-field issues. He caught on with the Indianapolis Colts but was waived by the franchise on Nov. 27, 2014, despite Purifoy finding some success on the field. Why? Multiple Colts beat writers explained that Purifoy had a minor disciplinary issues while in Indianapolis that, when all added up, led to the team cutting him free. The Seattle Seahawks – and Purifoy’s former defensive coordinator with the Gators, Dan Quinn – immediately picked him up off waivers, only for Purifoy to fail a physical and miss the remainder of the season. 3 » Former Florida point guard Nick Calathes, after spending two years in the NBA as a reserve for the Memphis Grizzlies, has decided to return to Greece. Calathes last week signed a three-year, $7 million deal with Panathinaikos, bringing him back to the team that signed him out of college in 2009. He spent four seasons with Panathinaikos (2009-12), leading the team to back-to-back Greek League titles (2010-11) as well as a Euroleague crown (2011). Calathes continued his career with Lokomotiv Kuban (2012-13) before landing with Memphis for his NBA rookie season in 2013-14. In terms of monetary gains and starting ability, Calathes’s best opportunity is with Euroleague franchises. He is the second former Gators player to join a Greek power this offseason. As first reported by OnlyGators.com, former Florida center Patric Young bypassed NBA Summer League opportunities to sign a two-year guaranteed deal with Olympiacos. He will likely try his hand at the NBA again once that contract comes to an end. 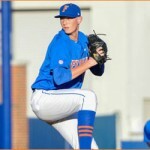 4 » Right-handed pitcher Brady Singer, a Florida baseball signee who was selected in the second round of the 2015 MLB Draft by the Toronto Blue Jays, has chosen not to sign with the franchise and will instead play for the Gators next season. “I have decided to attend the University of Florida and [I’m] excited to be a part of [the team],” he wrote on Twitter. 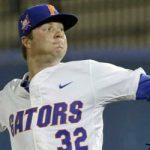 Florida’s pitching staff looks to be loaded next season with junior left-hander A.J. Puk on his way to becoming an ace, junior RHP Logan Shore locked in as the Friday starter and sophomore RHP Alex Faedo solidifying himself as the No. 3 pitcher in the postseason. The Gators have talent beyond those three, and Singer will just add to what could very well be the best staff in the nation in 2016. 5 » Former Gators dazzler Erin Andrews and soccer star Abby Wambach both appeared at Nickelodeon’s Kids’ Choice Awards this week and spent some time together backstage. However, while on the stage, the duo did something even more enjoyable for Florida fans – they Gator Chomped together. Though OnlyGators.com has been unable to find video of this as of press time, below is a screenshot of Andrews and Wambach being Gators. 6 » Former Florida quarterback and graduate assistant Kerwin Bell has spent the last eight seasons serving as head coach of the Jacksonville Dolphins of the Pioneer Football League. The Dolphins have seen an incredible amount of success since Bell took over, including conference titles in 2008 and 2010, leading many fans to demand that former Florida head coach Will Muschamp hire Bell as his offensive coordinator. Yet despite all his success in Jacksonville, Bell’s accomplishments will no longer appear on the school’s record books. The PFL announced Friday that it has vacated five years worth of victories – along with one of Jacksonville’s two conference titles – from the Dolphins, also serving the school with a one-year postseason ban. Why the punishment? According to The Florida Times-Union, Jacksonville was found to have violated financial aid restrictions; more specifically, the Dolphins gave financial aid more often to players than the general student body. The PFL does not allow players to be on scholarship for athletic reasons. Strangely, an independent review determined that no NCAA violations were committed and the financial aid distributions came from senior-level school officials, yet the punishment – which also includes a reduction of 34 roster spots and 3 coaches, and the cancellation of JU’s junior varsity program – will stand. The Dolphins also sat out the 2014 postseason and gave up an opportunity to participate in the FCS championship tournament. So, is Scottie signing with Philadelphia, as reported yesterday…or is he going with the Greeks, as reported today?? Scottie Wilbekin and Nick Calathes are different people. It’s not really that strange for JU’s punishment to stand even though there were no findings of NCAA violations. The NCAA doesn’t have any rules against financial aid or scholarships awarded based on football talent. In fact, the entire enterprise depends on it. JU competes in the Pioneer Football League, which does not allow scholarships or financial aid to be awarded to football players based on their football ability. Thus, JU broke PFL rules and was hit with PFL penalties. JU didn’t break NCAA rules, and will not be hit with NCAA penalties.